Less than a month ago New Castle native Dalton Rosta picked up a huge TKO victory in the cage at the Rivers Casino. Last night he picked up a TKO victory in the boxing ring during the amateur portion of a Pro-Am card promoted by World Fight Championships at The Meadows Casino. Rosta is now a perfect 5-0 following his destruction of John Demus as an amateur heavyweight boxer while also maintaining an unblemished 6-0 as one of the top light heavyweight MMA fighters in the nation. 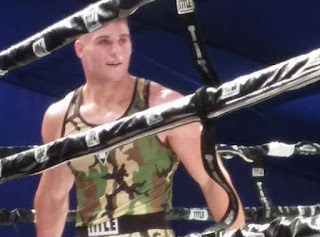 Trained by Sammy Calderone at Downtown Boxing Club in his striking game, the 22-year-old Rosta remains one of the most active and successful fighters on the local scene in both the cage and ring. Stay tuned to Youngstown Boxing News as we will let everyone know the next time Rosta will be in action and in which sport.